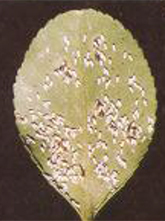 Euonymus scale attacks a number of hosts including species of Euonymus, Camellia, Buxus, Celastrus, Daphne, Eugenia, Hedera, Hibiscus, Ilex, Jasminum, Ligustrum, Lonicera, Olea, Paxistima, Pachysandra, Solanum and Prunus. 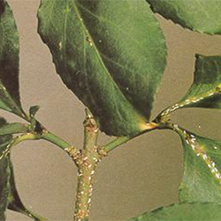 Heavy infestations can cause premature leaf drop, twig dieback, decreased resistance to winter injury, complete defoliation or death of the plant. 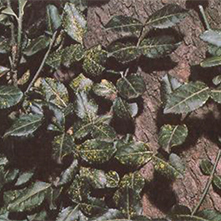 The euonymus scale is often overlooked until it has caused serious damage. One symptom of a light attack is the occurrence of yellowish or whitish spots on the leaves. The female scales are usually found along the stems and leaf veins of the host plant. At times, however, the whole plant is whitened by the smaller male scales. When this occurs, the plant’s leaves may drop and sometimes a normally green plant becomes bare by midsummer. Hedge clipped plants and plants growing close to buildings seem to be damaged more than those growing where there is free air circulation. This pest frequents the stems at ground level, where they are well protected. The scales overwinter as fully grown fertilized, grayish to brown females, which are easily distinguished from the smaller whitish males. Eggs are deposited in early spring, beneath the dark-colored female scale covering. The eggs hatch over a period of 2 or 3 weeks in early June. The nymphs crawl to other parts of the host plant or are blown to other susceptible hosts. A second generation of crawlers develops by mid-July. Maintain good health through regular fertilization and proper irrigation. Remove badly infested areas to reduce breeding. Apply insecticidal soap, horticultural oil or approved insecticides throughout the season and especially at the crawler stages.